Gillian and Josh tied the knot during their Isola Farms wedding in Groveland, Florida. The two envisioned an outdoor wedding that had a rustic and romantic vibe with lots of greenery and flowers. Just three years ago, Gillian and Josh met by chance on a dating app where they both swiped right for love. Chatting it up over text, the two decided to finally meeting in person and have been inseparable since that very day – August 23rd of 2014. As their love has grove over the years, the two have become closer as a couple and as they explain “could not imagine life” without one another. Josh fell in love with the beauty that radiates both inside an out from Gillian, while Gillian fell in love with Josh’ kindness and good heart. Through their constant love and perseverance, they have made each other better people. Just a year later after dating on October 25th of 2015, Josh planned out a fun filled Fall day with pumpkin carving. Little did Gillian know that this day would go down in history as the start of their forever. While in their apartment in Dunedin, the two began carving their pumpkins. Josh finally having finished his, turned to Gillian to show her his masterpiece. Inscribed on the pumpkin was him asking her to marry him, which she of course said, “yes!” I truly do not know if anyone could ever top a pumpkin carving that good! Their wedding day was filled with love from the moment we arrived. A close family friend, Lori, helped in coordinating and setting up along with the team of Isola Farms. Gillian arrived shortly after we did for her getting ready portion of details, putting on her dress, and of course bridal portraits. The girls looked just darling in their floral robes and while I could tell Gillian was a little nervous, she was also incredibly excited to see Josh for their first touch. Hidden behind a set of doors opening up to the ceremony that he had built himself, Josh patiently waited for Gillian to arrive for their first touch. Walking up, Gillian radiated in her Allure wedding gown as Josh was safely hidden behind the other side of the door. Sharing a beer, a few words of excitement, and Josh surprising Gillian with a gift made for a beautiful moment before their ceremony was to begin. The backdrop for their outdoor ceremony included three stunning chandeliers that cascaded from a massive oak tree. A horse and donkey watched with intrigue in the backdrop as well and of course, guests could not resist going over to see the adorable furry on lookers. Their family friend, Kirby, married the two and talked about the power of love. Sharing their vows and a first kiss, the two realized they were official Mr. and Mrs. as they walked down the aisle in sheer joy, hand in hand. Formal portraits with their family and wedding party followed the ceremony back at the same location – the lighting was just too beautiful not to use! 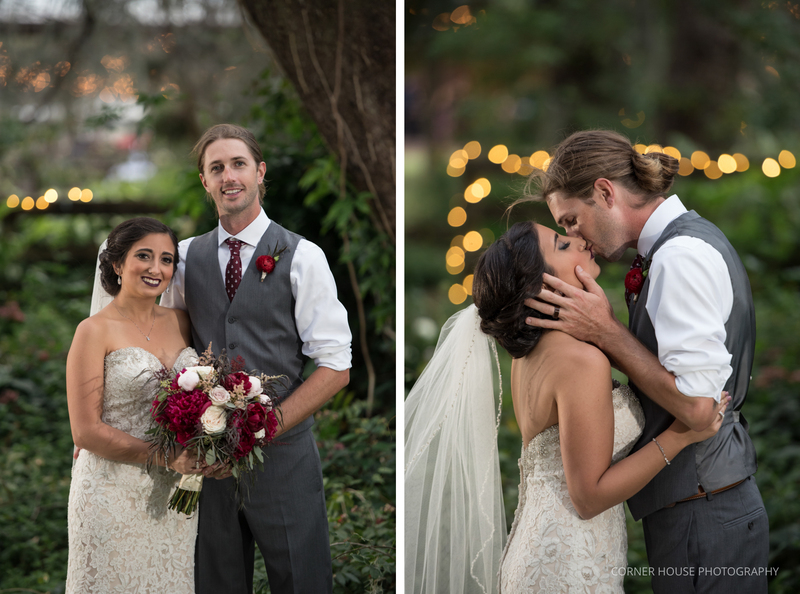 Newlywed portraits took place throughout the property with an assortment of tangled vines, trees, and foliage growing with sporadic beauty. It was like we had stepped into an enchanted garden that was allowed to grow as it pleased. Of course, their reception was filled with lots of love as guests greeted our sweethearts during dinner and danced the night away. Wishing these two amazing people a beautiful life together! What a beautifully natural set of photos, absolutely love your style! You seem to have captured all the perfect moments here.